Vera Pagotto (Duchart) nee Werenka - Edmonton's Burial & Cremation Professionals | Trinity Funeral Home Ltd.
We are saddened to announce the passing of Vera on November 25, 2018 at the age of 86 years in San Fior Di Sotto, Italy. 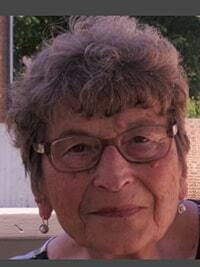 Vera was born December 30, 1931 in Musidora, Alberta and moved with her family to the farm South of Sangudo in 1948. She spent her working years in Edmonton, and later moved with her husband to Italy in 2004. Vera is survived by her husband Jerry Pagotto, sisters Tillie Ostrowercha, Olga (Joe) Blahun, and Ann Blahun, as well as numerous nieces and nephews, extended family and friends. Vera was predeceased by her parents John & Agrepena, sisters Florence Kaplain and Love Pohynayko, brothers Orest Werenka and Russell Werenka, brothers in law, Ray Ostrowercha, John Blahun, and Steve Pohynayko, and sister in law, Florence (Weber) Werenka.